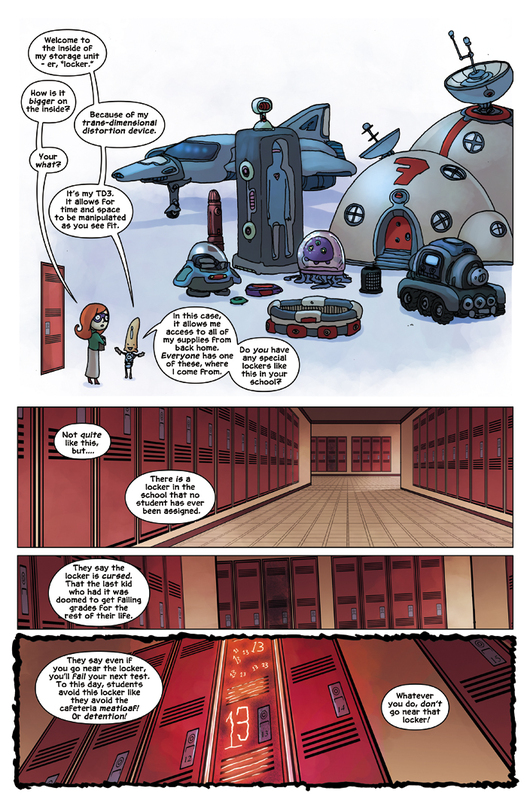 Happy middle of the week day (Wednesday), and behold a new Albert the Alien – and a story about lockers! So Albert has a device that can bend time and space – a storage device where he can access all of his stuff at any given time from any place with a Trans-Dimensional Distortion Device (TD3). Basically, it’s like accessing digital files from a cloud, only this is for physical objects. How cool would it be able to access your stuff anywhere you went? If you took a long trip and wanted a bulky toy, you could get it from the TD3. Forgot to pack your important personal item, but you put it in the cloud? No worries – you can access it right away! Want to share your stuff with your friends – it’s all good! Just give them access and they can return the stuff they borrowed, no muss no fuss. Yeah, I think it would be awesome! Gabe drew a number of fun things to go into Albert’s locker – including a Metroid-like creature in a glass globe. Fun stuff that a middle school alien kid would likely own. What would be in your ideal alien locker? Then we switch focus to “the mystery locker,” which Gabe numbered as “locker 13.” It’s my experience that in every school there is that one undesirable spot – sometimes a locker, sometimes a seat in the classroom or cafeteria. And in my past schools, there’s always a spot that’s considered unlucky. In my old school, it was this off-colored sidewalk tile. At WMU (granted, a college campus) it’s the “W” in the middle of the campus. If you touch these things, you risk failing your next test. So I wanted to combine these two elements in Albert’s world to be the cursed locker. We will find out more about the mystery locker much later in Albert’s adventures. Do you have any fun mystery lockers in school, or cursed areas?